NF series air-spraying rice milling machine is suitable for whitening clean rice which sprayed air from the milling roller into the whitening chamber to increase rolling times for much better whitening process. This rice milling machine can be used dependently or used as the polisher with humidification change the polishing roller, it is applicable in rice mill of the production capacity from 120-160 ton per day. 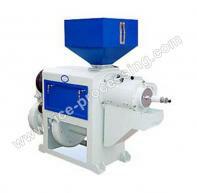 1.Adopts low rice temperature rising technology to reduce the rice breakage rate. 2.The radical air-sparing promotes rice overturn much more sufficient and uniform. 3.Can be used dependently, or combined with emery roller rice milling machine, the whitening effect will be better, high precision and clean rice. 4.Professional exterior blower bring the airflow to turnover the rice and blow the rice chaff out of the rice screen for keep the lower discharging chaff rate. 5.Air-sparing milling is good for lowing rice temperature and improving rice color luster, and increasing the rice output. Our company is specialized exporter, manufacturer and supplier of NF Series Air-Spraying Iron Roller Rice Milling Machine in 中国.